Can Orange Juicers Improve Your Health? 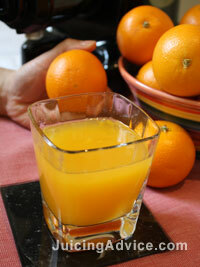 Freshly squeezed orange juice…the very words get your mouth watering. But can making your own with at home orange juicers really improve your health over supermarket brands? Can Freshly Squeezed Juice Come In A Carton? Take a trip around the juice aisle of your grocer’s and you’ll see many brands of orange juice claiming ‘fresh’ or freshly squeezed’. They may have a very quick expiry date, which adds credence to their claims of freshness. But are they really fresh? Do these juices have the same benefits as juice you make yourself from fresh oranges? The short answer is no…they don’t! All of the juices in the supermarket have been pasteurized in order to extend their shelf life. This means they have been heated to destroy any pathogens. But, heating also destroys many of the vital nutrients! Why bother drinking orange juice, or any juice, for that matter when the very vitamins and other nutrients you are looking for aren’t even there anymore? In the photo above you can see a glass of my freshly squeezed orange juice, no caton involved there! It gets worse when you look at regular orange juices. Have a look at the ingredient list on the side of the carton. You may see ingredients such as high fructose corn syrup, artificial coloring, preservatives and artificial flavors. Some products labelled as juice are little more than sweetened, flavored water with added Vitamin C.
Orange juicers, on the other hand, let you squeeze fresh, untreated juice straight from the orange…just like nature intended. All of the vitamins, minerals and antioxidants are intact in the proper amounts. And you never have to worry about any artificial ingredients, or added sweeteners, colors or flavors…all things that are foreign to our bodies. All you get is the pure, natural juice that your body was meant to deal with and use. 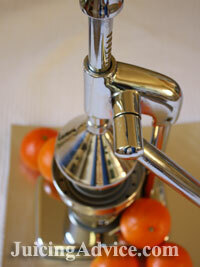 Here you can see my manual citrus juicer that is so easy and quick to use and wash up. You can use manual juicers, or electric citrus juicers to make your fresh juice. Electric models are much quicker and more powerful, and let you make a larger quantity of juice at once. They can also handle peels, seeds and other materials that come along with your orange, and will let you mix other fruits in with your juice as well, so you can add even more healthy ingredients to your morning beverage. So can orange juicers improve your health? The answer, clearly, is yes!